Studies show that those who travel have healthier minds, bodies, and relationships. They are known to have a reduced risk for heart attacks, less likely to suffer from depression, and a decreased amount of cortisol (the stress hormone) in the body. (1) With travel proven to decrease the amount of stress in a person, then why does travelling seem like such a time consuming hassle that includes endless planning and often times the dreaded airport trip? On any travel day, you're on edge. Whether it's due to the angst of flying and goodbyes or dreading the extensive processes and long lines, something that was once a luxury, has turned into a hassle. Shoes off, bag weight, TSA pokes and prods, carry-on size, delays, and over bookings are all inconveniences that we fight through before taking our seats. Most of the stress with flying can be controlled: plan ahead, arrive early, and pack smartly. But what if others don’t plan their trip as well as you have? Despite there being no official printed rules, there are certain airplane etiquette guidelines all airplane travelers should follow when flying. Issues like the armrest challenge (who deserves to use it), use the overhead bin over your own seat, board when you are supposed to and not before, and bathe are guidelines travelers can follow to make other trekkers not hate them. After polling the FIRE Light Group team, there are two main pet peeves our staff have that they encounter when traveling that make their flight less enjoyable. 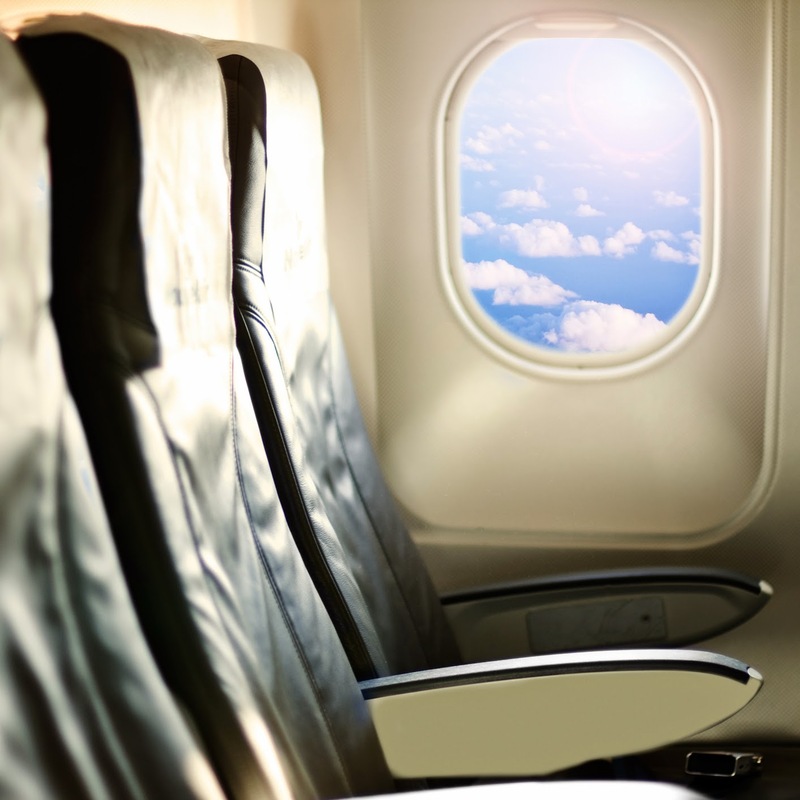 These are: when and if travelers should recline their seats and those who bring more than they can carry. When asked what bothered her most about airplane etiquette, Sandra, FIRE Light Group CEO, stated “Mine is the reclining seat from the person in front of you who seems to have no regard for the fact that you now have their seat in your lap! Just because seats recline on an airplane does not mean you should not think about the person behind you when you recline – less than 100% would be appreciated!” According to a study by Expedia, “Seat Back Guy”, defined as the passenger who reclines his seat fully once the plane has left the ground, ranks #7 on the list of travel-etiquette offenders. Thirty-five percent of Americans report having experienced major discomfort due to reclining seats, and 42% would like to see reclining seats banned entirely! This being said, 80% of fliers admit to reclining their seats during flights, with 1 in 5 reclining right after take-off. (2) While flying, try to remember how it feels to get the seat in front of you shoved in your face, and be considerate of the person sitting behind you. Be cautious when reclining your seat back, and make sure to NEVER do it during food service because it makes eating near impossible for the person whose tray is attached to your seat. The second main pet peeve our staff has is dealing with those who pack more than they can carry for a flight. Dustin, Director of National Accounts, stated that he dreads when people bring more than they can carry and rely on everyone else to lift their luggage for them, or their bag is too heavy and they can’t put it in the bin themselves and expect stewardesses to help them. Expedia ranked this annoyance at #8 in their poll, showing that 10% of Americans admit to ignoring the airlines carry-on baggage rules entirely. (3) When passengers have to stop and fight with their luggage to fit and shove it into the overhead bin, it not only takes up valuable space for others to put their luggage but it also holds up the line and makes boarding the plane take even longer. When packing, take the time to make sure your luggage not only fits the airplane’s size guidelines but also is a weight that you can manage to lift yourself. This will ensure a smooth boarding of the plane and shorten the time it takes you to get to your seat and relax. Despite all setbacks, most Americans feel warmly about their fellow passengers with 84% agreeing with the statement: “For the most part, fellow flight passengers are considerate of other passengers”. (4) Simply remember what bothers you when you fly, and take the time to make sure you are acting in a considerate why towards others and your flight will go smoothly and peacefully! 1. Parker-Pope, Tara. "How Vacations Affect Your Happiness." Well How Vacations Affect Your Happiness Comments. The New York Times, 18 Feb. 2010. Web. 10 June 2014. 2. Gavin, Sarah. "Expedia News." Expedia Viewfinder. Northstar, 9 Dec. 2013. Web. 10 June 2014. 3. Gavin, Sarah. "Expedia News." Expedia Viewfinder. Northstar, 9 Dec. 2013. Web. 10 June 2014. 4. Gavin, Sarah. "Expedia News." Expedia Viewfinder. Northstar, 9 Dec. 2013. Web. 10 June 2014. Millennials: Aren’t we the worst?